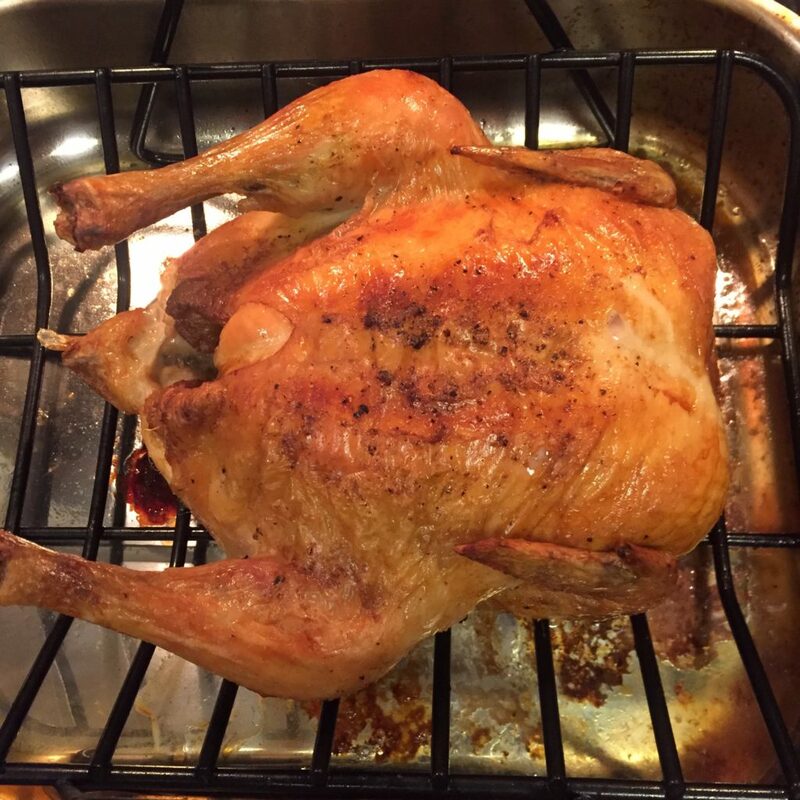 I am not going to write an essay about how easy it is to roast a chicken (very) or how anyone (even you!) can do it because Michael Ruhlman said it much better than I ever could. I will say that roast chicken hits a spot in my heart that I don’t understand – eating roast chicken feels like coming home. My recipe is slightly fussier than Ruhlman’s, but either is fine. It’s hard to screw up a chicken. I tossed a couple of potatoes in the oven whilst the chicken cooked, and we had baked potatoes as a side dish. Delicious! Start heating oven to 425F. Melt 2T butter. Put rinsed-off chicken in roasting pan with a V-shaped basket. Use a brush to rub the butter all over the chicken. Sprinkle chicken liberally with salt & pepper. Position chicken with one wing side up. Put chicken in oven when it’s finished warming up. After 20 minutes, flip the chicken over to its other wing. After a second 20 minutes, flip the bird breast side up. Put a meat thermometer in the breast and cook until it hits 160F, about another 20 minutes depending on how big the bird is. Remove from oven, let rest for 15 minutes. Carve and eat.